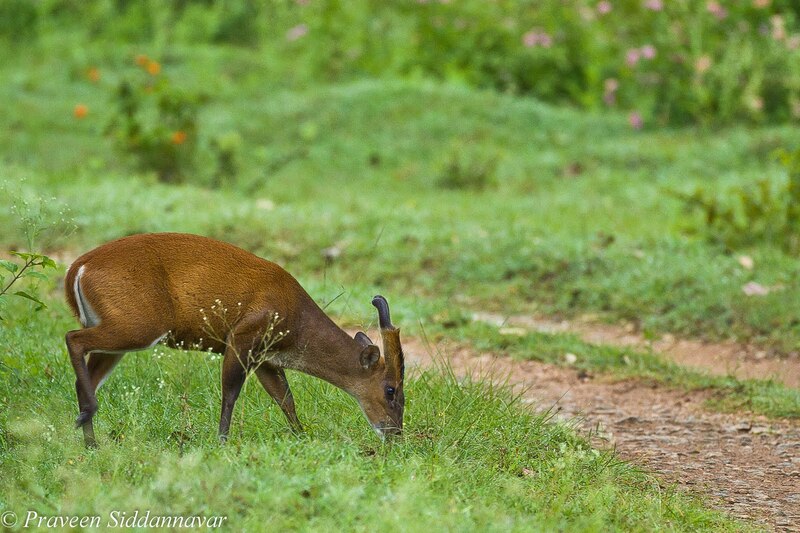 Praveen Siddannavar's Blog: The Handsome Male of Bandipur! It was the 20th August 2010, a peak monsoon season in south India. During this time sightings are normally dull & it is believed that the wildlife makes its appearance when you least expect, not sure how true this can be. I was all geared up to take up the morning safari ride, I had Kiran as my driver. I was checking and making sure if I had carried all my accessories related to my camera equipments. It has happened with many of us that we realize in the middle of the forest that the battery is running out and there’s no spare one or probably the memory card is full. I ensured that everything was intact, so we were all set to drive into the forest of Bandipur Tiger Reserve. Fortunately there was only a light drizzle, the light also seemed fine. As I boarded the jeep I asked Kiran to drive towards Mulapura area, I remember once I and my cousin Jaideep Siddannavar had sighted a tiger in Mulapur water hole but it was just a glimpse, as soon as it heard our jeep it disappeared in the undergrowth, so it was a big miss. Our drive continued & we passed through the famous surle-katte that is lucky for me as I have sighted leopards on several occasions. I remember earlier this year I had spotted 2 leopards in courtship mood, unfortunately the leopard couple was too far and I only managed few records shots. It is a nice feeling to remember the sightings that had happened in this area. As we drove past this area I spotted a Muntjac (Barking Deer), this a shy animal and luckily he was grazing in the open at a distance. I asked kiran to stop and switch off the engine, fortunately the barking deer didn't notice us. 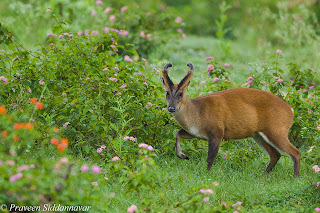 I quickly took this opportunity to photograph him, after couple of minutes the deer realized our presence so he turned towards me and I clicked another shot. 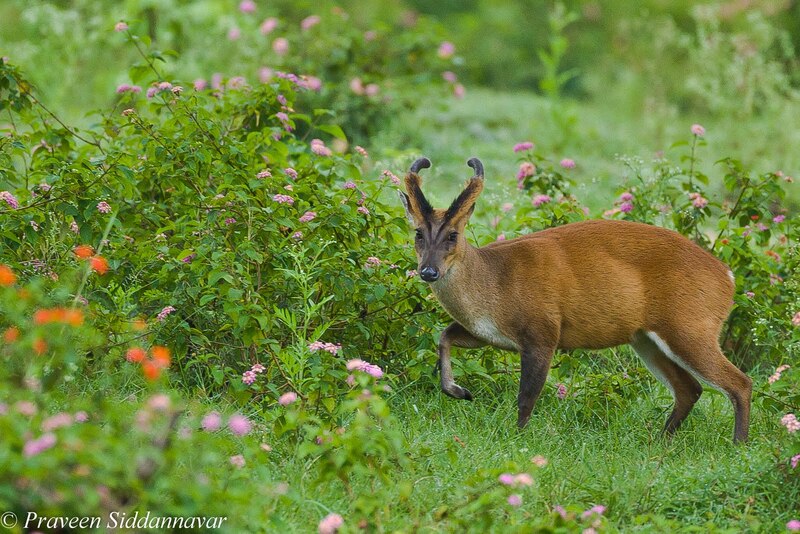 I love these images simply because of the habitat, lovely lush green grass & the wild colorful lantana flowers. A perfect setting to shoot any animal. It was about 7am we were about to reach the Mulapura water hole & were driving past through a dense bamboo tree on our right. I suddenly whispered see Tiger!, everyone in the jeep were like where… where. Look there near the water hole. 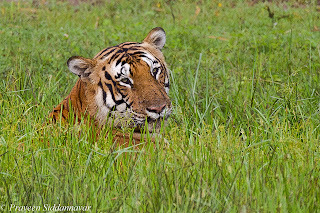 No one could easily spot it as only the head of the tiger was visible through long grass. Wow! 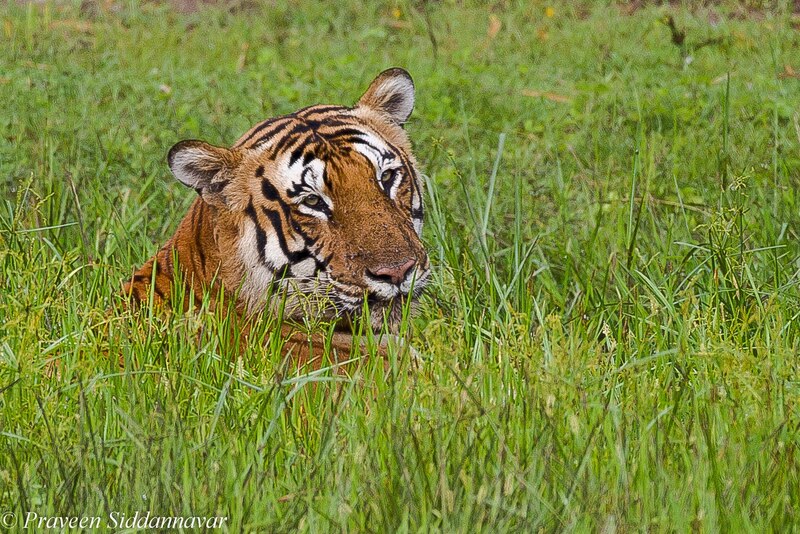 I couldn’t believe my luck, tigers are so elusive & getting one in the open is a rare moment. I immediately asked Kiran to switch off the engine as the jeep would roll over some distance in neutral gear & also this time I didn’t want the tiger to disappear with the noise of our jeep. The tiger was cooling off itself in a muddy pond, now all of them in our jeep spotted it. 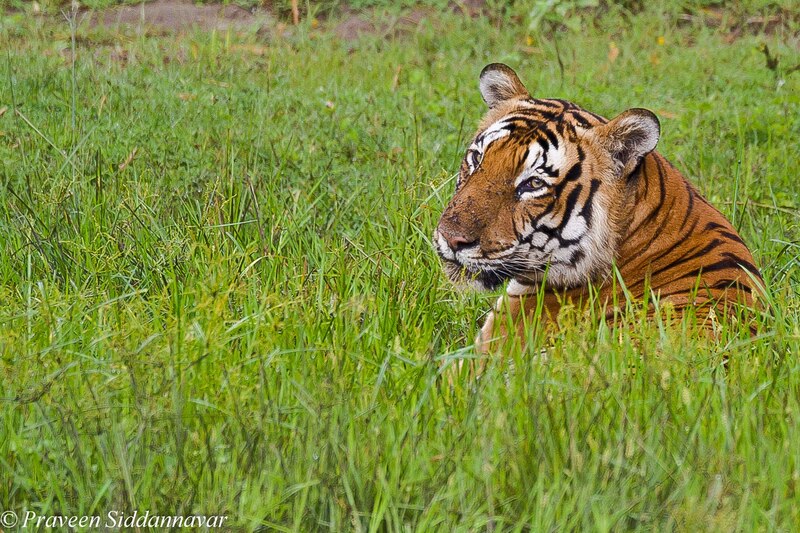 One of the guests in our jeep was really emotional, the reasons for his emotions were that he has been visiting forest for past over 15 years, and after such long wait finally he sighted a tiger. The tiger’s 3/4th body was soaked in the murky water & he was almost dozing and hardly opened his eyes. To me photographing any animals without eye contact is worthless. 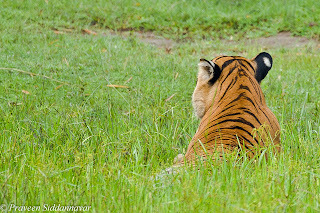 The tiger looked at us once and started to doze again, I knew that it is a waiting game here and one needs to show lot of patience. 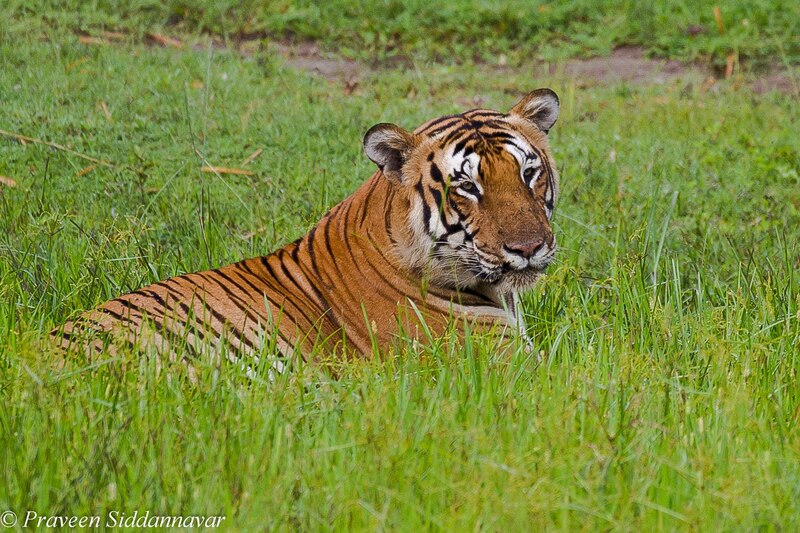 Our persistence paid off & the tiger turned towards us & I grabbed the opportunity to take few shots. 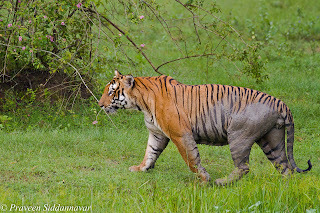 The tiger probably had made a kill either early morning or the previous night & in such cases it is natural for the tiger to be exhausted and he has to cool off in water due to excess heat generated in the body. 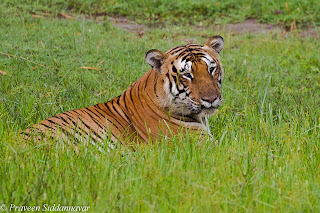 After a while the tiger realized that he is being watched by us and I also noticed that he is being irritated with a group of flies sitting on his nose and forehead. Since the tiger had made a kill and some part of the meat was stuck on his face hence he was attacked by the flies. Until now ours was the only jeep so there was no disturbance of other tourists else some general tourists make so much noise on not only seeing a tiger but keep chatting in the jeep as if they are in a public garden. 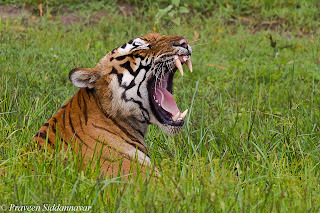 I kept myself busy clicking the tiger images and suddenly I observed that the tiger was just about to yawn and I quickly changed my camera setting to burst mode. 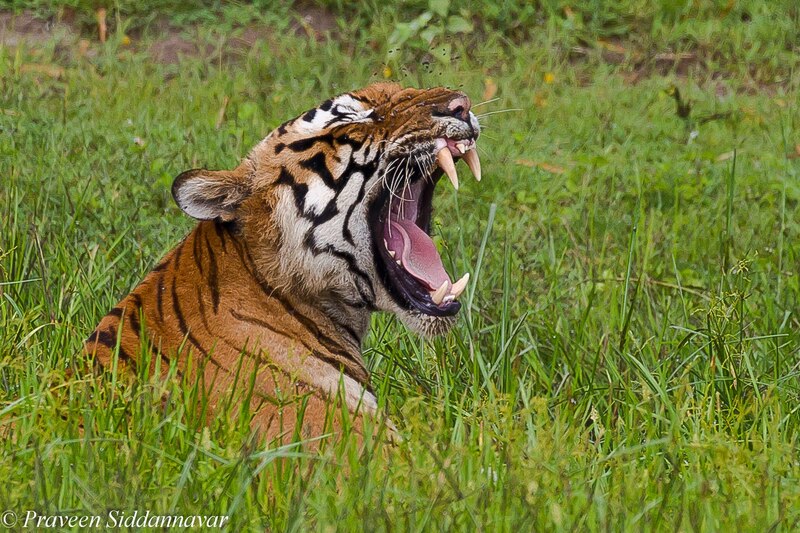 The yawn began and it was quite a big one, it is a treat to watch such a natural behavior in tigers. The tiger was quite far but I was glad that I got some decent shots. Another interesting observation in the tiger yawning image is that you will notice that the group of flies fly away as he yawns. I continued to shoot more images, and suddenly my attention was diverted towards a White Breasted Kingfisher on our right. 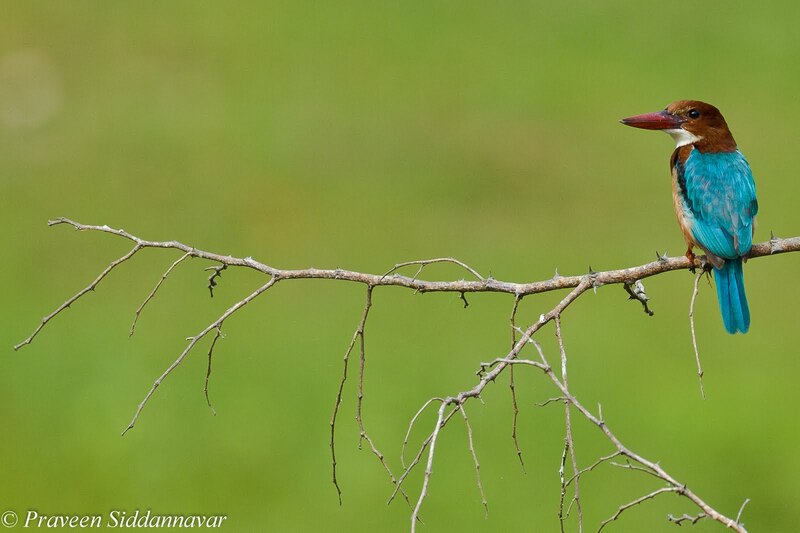 I loved the way this kingfisher was perched in the open so I managed few images of her. 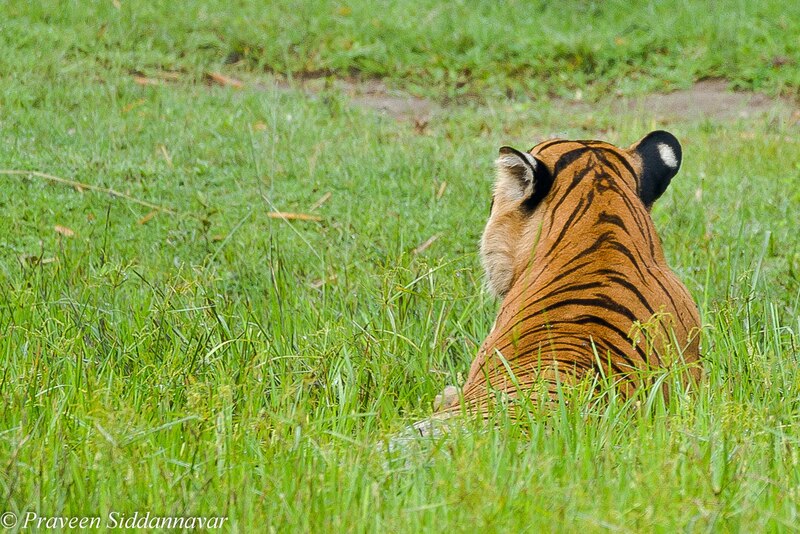 After about 15 mins the tiger decided that he had enough of mud bath so he got up & headed towards the dense area. 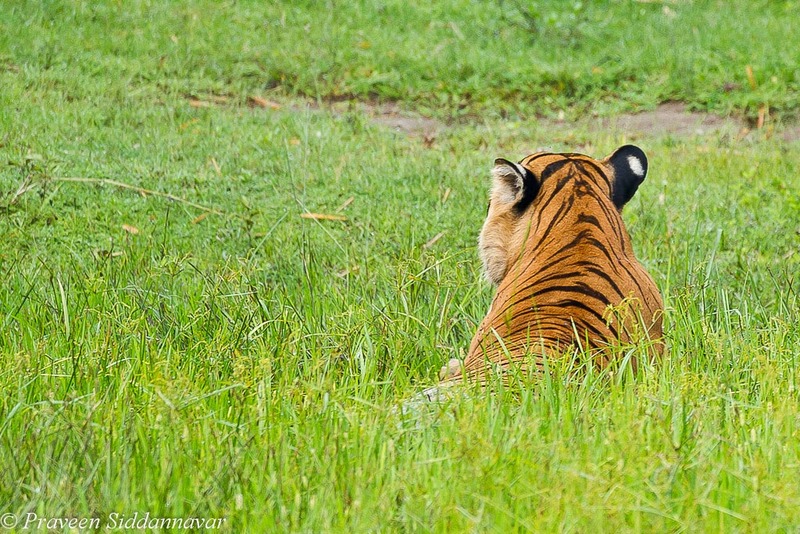 I was happy clicking few more shots and later the tiger disappeared in the bushes. 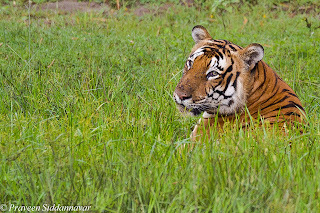 Sir beautiful snaps of the tiger in its various moods. Also looks like chances of seeing the tiger at Mulapura water hole are more. Thanks for sharing your experiences and pictures as well. The World in Her Stride! Window to a Stealth Predator! A Lazy Leopard on Sunday!